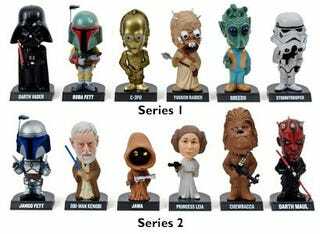 The best recommendation you could ever get for this 12-pack of Star Wars bobbleheads comes from Woot, where a proud collector explains how these little guys comforted him after a series of bizarre "accidents." I lost my job. You remember: I'd been working all those hours getting that presentation ready. If I'd aced it and landed that account, I probably would've been promoted to head of marketing for the Midwestern division. That job would have left me even less free time to spend with my bobbleheads, but how could I pass up an opportunity like that? Well, you know how. By oversleeping that morning and missing the presentation completely. I still don't get it. It's almost as if someone had slipped me some kind of sedative the night before. And I've never seen an electrical cord spontaneously cut itself in half like the one on my alarm clock. Talk about bad luck. Of course, I got fired and had to move in with my Mom. Things got even weirder after that. I'll admit, it annoyed me that Mom was always on my case about how I needed to grow up and get rid of my "toys" (that's what she called my Star Wars collectibles). But I never wanted anything so terrible to happen to her. I'll never forget coming home and finding her on the floor of my room. That faraway stare in her eyes. That look of sheer horror on her face. That froth coming from her nose and mouth. Her hair had turned completely white and she couldn't stop shaking. She hasn't spoken since. The doctors still don't know what happened. Once again, I sought comfort in you, my plastic soul mates. Don't you want some of the bobbleheads right now? If they helped this guy through such tribulations, imagine what they could do for you.